• Bathroom with Corner bath & overhang shower, washbasin, WC. • Attic with double bed, wardrobe and door leading to the Terrace. We are an English family who's fallen in love with the area and Siran village. We have visited a few places and the house in Siran has won our hearts. We have been travelling to France for a few years and fallen in love with Languedoc region. It has everything we love on holidays: sea, walks, interesting historical places to visit and of course not to forget: wine tasting. • Bathroom situated on the 1st floor: Corner bath with overhang shower, washbasin, WC, cupboard. The Gîte itself was spacious and reasonably furnished, although some of the furnishings and equipment were approaching needing renewal or restocking. The starring feature was surely the roof terrace with wonderful views across vineyards, the foothills of Monagne Noire rising on one side of the village, whilst on the other the Corbieres were visible with the Pyrenees beyond them on most days. This house was not disappointing it was clean, spacious, the attic bedroom onto the terrace was beautiful with breathtaking views of surrounding wine growing region and Mountains. Siran is a lovely village and well situated for exploring the wine region of Minervois, we recommend a visit to Carcasonne castle it is well worth the ride of approximately 45 minutes. The loacal town of Olanzac holds a Market on Tuesday well worth the 10 minute ride the cheese's we purchased were delicious along with a glass of local wine we definitely recommend. Also in Olanzac we found an excellent restaurant called La Belle so good we went twice. We did take some exercise during our holiday! Down at Homps there is the Canal du Midi and Marina where there is a chance to Cycle Hire, take a boat trip or take a pleasant stroll. I want to go back to Siran! The house is situated in the centre of a peaceful village that is situated in a beautiful part of France. The village has history and also has a lovelly bar near the church that has live music and good food. There is no parking at the house but there is a car park a very short distance away that always had plenty of spaces. The house is very well presented and was a delight to stay in, with a lovely terrace of the third floor bedroom which gave a view of the mountains and the village. All of the rooms are well equiped especially the kitchen. The location is ideal for visiting beaches, lakes, rivers (for kayaking, Roquebrun), Carcassonne walled city and the Canal de Midi. I recommend Homps for the lake and the restaurants in the village, Le Somail for hiring bikes for the Canal (run by an english guy), short trip across the mountain to Olargues with great lagoons and restaurants, and for a slightly longer journey, Lac De Laouzas or St. marie Plage near Perpignan. We are a middle aged couple and had no kids with us. We visit France every year, never been to this region though. We had a wonderful holiday, the property was perfect. Roomy,very well decorated with a very well equipped kitchen. We were particularly impressed with the attic bedroom and terrace. The location is superb, the village is very relaxing and has a friendly feel. The surrounding area is breathtaking, mountains, vineyards, the med and fantastic medieval villages. The property, village and surrounding area exceeded our expectations. We had a wonderful time in the cottage in autumn 2008. It was cosy and comfortable for us and our two year old son and we loved using the woodburner on the cold autumn nights! It is really well equipped, very clean and perfect for children as there is an adjoining bedroom. The roof terrace has great views and is next to the master bedroom which has been beautifully renovated. The area has much to offer and Siran is a good base for exploring. The vilage is small but there is a nice bar and a couple of shops for basics and the nearest supermarket is 5 minutes drive away. I would recommend this cottage for a small family or 2 couples and it definitely has the potential to be used at any time of year. We spent 2 weeks in July there and had wonderful time. The property is newly renovated with the exception of a few finishing touches, but that did not bother us at all. We were 2 adults with 2 grown up children but, in reality, the property sleeps 6 people comfortably. 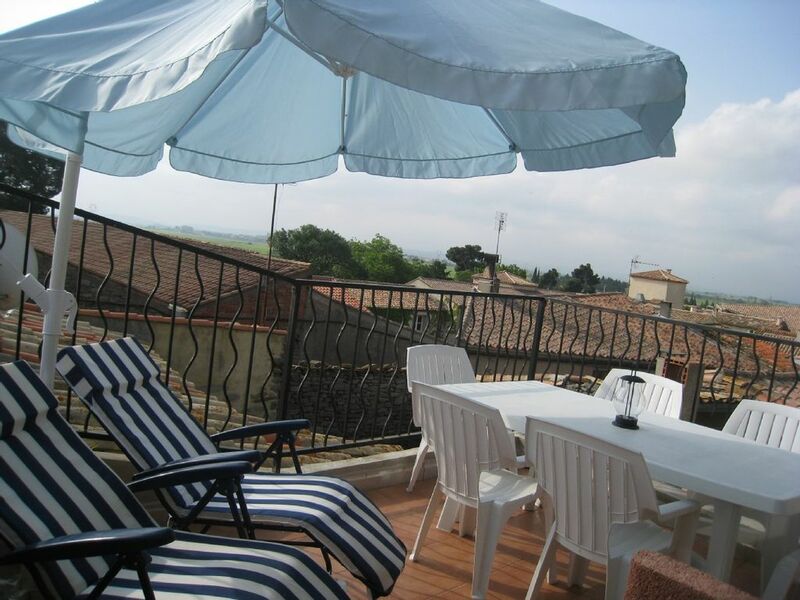 The location is strategically situated in the heart of the Minervois / Corbieres region. Day trips to local sites of interest take no longer than 1 hour. Beaches are just 40 minutes by car. We also took a 2 day trip to Barcelona. Driving down is about 3 hours. We got to see the fireworks on la Fête Nationale (Bastille Day, July 14) in Carcassonne and they were spectacular. We also had the chance to take a glimpse at the Tour de France during our stay. Communication with the landlords was flawless. The local property manager was very accommodating. We communicated with her in French, but I do believe that she speaks English. Excellent place (one of only few left in Europe) for a budget, country vacation. Nice brake from the all-inclusive, condo-ed, time-sharing, cruising, etc. holidays. One of the neighbouring villages of Homps, a five-minute drive away, is a port on the Canal du Midi, the historic 17th century waterway that links the Mediterranean to the Atlantic. It is one of the most scenic ways to travel through the surrounding landscape of vineyards and pine woods. Small motorboats can be rented, or there are day trips on old barges to the city of Béziers near the coast and Carcassonne to the west. • Jouarres Lake has a delightful leisure facility and well worth a visit especially with the children. There is a separate swimming area with trained lifeguards in charge. The sailing area is away from the bathing area. In the summer season, a range of surf board courses is on offer in the sailing area. • Gruissan beach offers miles of soft fine sand with lots of room for games. A gently sloping beach and virtually no waves and no tide make for calm, safe bathing. • Carcassonne castle is like a little village with many shops & restaurants. Other Activities: boat hire, wine tasting, canoeing.